Angry Birds Fight mixes RPG elements with multiplayer match-three battles as gamers go to war against other birds and pigs alike. Rovio has announced the worldwide release of Angry Birds Fight on iOS and Android devices. The match-three puzzle game was created in collaboration with Kiteretsu, and features multiplayer battles with players challenged to clear islands and defeat the pigs. In each battle of Angry Birds Fight, players are given a limited amount of time to create as many matches as they can, which impact their attack and defense stats in the upcoming battle. When time has expired, the opponents duke it out, and the character with the higher accumulated points wins. Battles are separated into islands and levels, with some battles removing the multiplayer component, and instead challenging players to defeat pigs on the high seas. The game offers two separate energy systems, with one for head-to-head battles and one for ship battles. Energy recharges automatically over time, or can be purchased with premium currency. Angry Birds Fight offers RPG elements, allowing gamers to collect gear for their birds and ship, which may increase their overall strength or defense. As players progress, they’ll collect coins which can be spent to upgrade these items, increasing their stats. Players unlock additional birds for their team, as well as additional gameplay modes over time. Each bird has a different sabotage effect, which can be used to trip up an opponent. Bomb, for instance, can turn the game board black and white for a limited time, while Stella causes bubbles to float in front of the gameplay board, limiting one’s view of symbols, and so on. In addition, each bird also has access to exclusive weapons and accessories. Gamers can spend premium currency to open chests containing new and hopefully better items. In terms of extra gameplay modes, users can replay completed stages against computer-controlled characters in special challenge matches, earning prizes in the process. In addition, arena and monster modes will allow players to complete special events, but as of this writing, no active events are taking place. Angry Birds Fight, the latest cultural mash-up of 2015, can be enjoyed by anyone in the world regardless of gender, nationality or age. 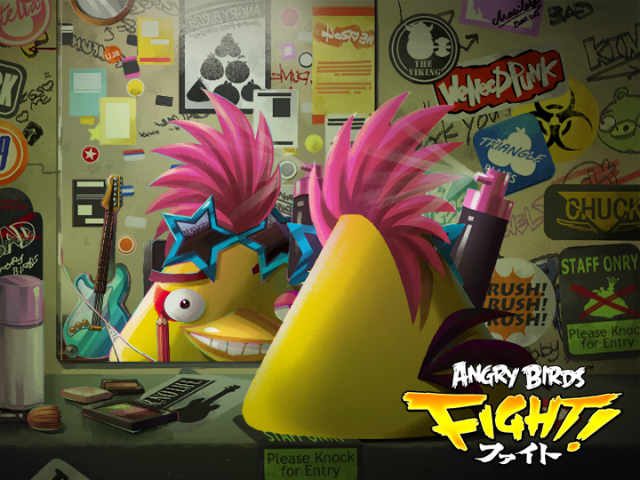 We’re thrilled to be part of bringing the worlds of Angry Birds and Japanese style game design together. Angry Birds Fight is available to download for free on the iTunes App Store and Google Play. Before this worldwide release, the game was downloaded more than three million times in Asia Pacific.